Colour is really important, make sure your colours complement but stand out. You can add as many names, numbers and logos for no extra cost. There are hundreds of possible variations we offer. Our 3D kit designer makes it easy to share kit designs with your team for agreement. So what is a “great kit” and how do I use your 3D Kit Builder? It really doesn’t matter if you’re a professional premier league football club or a bunch of mates who play cricket together. We always look at great kits and think “wow, they really stand out”. Well, thanks to our 3D Kit Builder making and designing your own custom kit has never been easier! Our kit designer has been designed with ease at mind, so the “how” to design a kit is easy and fairly self-explanatory. Simply go to our 3D Kit Builder Page, and choose your sport. Once you’ve clicked on your sport, just start clicking on the base designs that stand out most to you. Then you have a great foundation, but here’s the opportunity to make it your own, adding as many names, numbers and logos as possible. Don’t worry if everything isn’t in the exact perfect place or colour scheme, we will not manufacture anything without your approval. We will take the kit builder designs and have our in-house design team put it together in a high resolution visual for you to show the rest of the team. So that’s the “How To Design A Teamwear Kit Using Our 3D Kit Builder”… but how do we make a great kit? Well obviously the jury is very much out there on what makes a great kit, some kits are immortalised in our memories, kits that stand the test of time like this 1988 Wimbledon FC **((this will link to Spall Retro once live))** shirt. So this great kit, where do we start? Well, we’ve made the hard bit easy, we have had our professional designers work tirelessly to create the almost perfect base stock designs. They can’t be perfect from the get-go because we need to give the opportunity to make them unique. We offer the opportunity for you to customise kits from 10 sports, with over 100 possible designs, and hundreds of possible variations on the kits themselves! We manufacture for all sports. If your sport isn’t listed, please get in touch and we’ll see what we can do. The sports we offer you to customise, but this list isn’t exhaustive and in the past we have made sportswear for athletics, basketball, bowls, cricket, cycling, football, hockey, netball, rugby, volleyball, baseball, boxing, cheerleading, dancewear, darts, ice-hockey, lacrosse, motorsport, racket, rowing, softball and more. For our hypothetical sports kit design, let’s choose Rugby. Now I’m going to design my inline shirt first, and as soon as I click that I’ve got 8 near-perfect designs! There is absolutely no right or wrong here, you’ve just got to go with what grabs your eye first (provided it’s for the right reasons of course). For me personally, I love the look of all the designs; but the one that grabs me the most is the first design, so I clicked through onto that. And here we go, here we have it – we’re finally in the 3D stage of our 3D Kit Builder. Arguably the hardest stage for you here, how exactly do we choose our colours. Hopefully, your club or team already has a colour scheme in which case great, get popping those on. >If you have exact colour codes for your team, let us know and we’ll match the inks to be as close to that shade as possible. For this hypothetical team I’m creating, at the moment it’s just a bunch of us from the pub so we haven’t got a pre-decided colour scheme yet, so I’m going to make one. One of the great things about our 3D Kit Builder is the amount of creative control you have to really make it personal. In this design it does give an option to have a different colour collar, however, I’m going to keep mine the same colour as Colour 1 (The Main Colour). For my rugby design, I’m going for a brighter kit to help my team stand out on the field and be more formidable on the field. So for the collar and Colour 1, I’ve gone with Sky Blue, which is a great shade of blue to use for this design. Although you’ll notice that it doesn’t really blend all that well with the other colours the base stock design comes with. In order to make a truly great rugby kit, we’re going to have to apply some colour theory. Personally I quite like the stock colours that come with Design One, I just want a brighter design. So to compliment the Sky Blue shade I’ve swapped Colour 2 to BA Yellow. I then changed Colour 3 to White. I chose these colours to give it a blue and gold kind of look, with the complimenting yellow and white creating a fire like effect on the design. I’ve also chosen two similar colours to add a bit of depth and dimension to my custom rugby kit. My finished shirt, the gold effect hopefully will help propel my team to gold itself! Now when it comes to designing the perfect kit, the colours are completely individual and personal to the needs of the team. I quite like the colours I’ve chosen, I think the kit really pops out on the field thanks to the bright yet muted colours all supporting each other. However what isn’t individual is the colour theory, and some colours just won’t make a great kit put together. For inspiration, Google your favourite teams, look at what colours they’re putting together and you’ll start to get a sense of what makes a great kit. 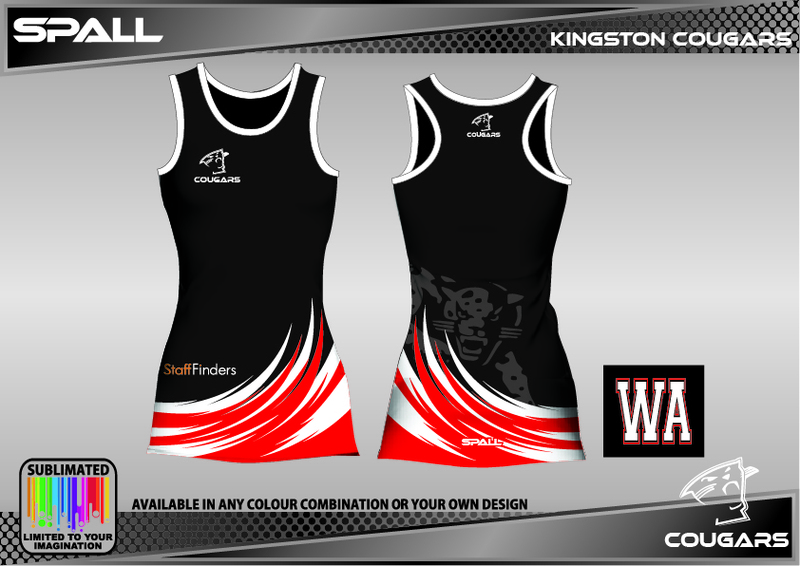 Now we need to put finish off our great rugby kit and then get some sponsors on. So once you’ve chosen your colours and set the Spall logo colour (I usually go for white on a design like this, as it ties in quite nicely to my colour scheme and should complement the majority of sponsor logos. However before we add the sponsor logos, we have the rest of the kit to build up. Of course, you could just get the shirts and use any old shorts with the kit; but we want a complete look to make us a formidable force on the field. To make life easier for you we’ve added a button to quickly take you to the shorts. To complement this design I’ve decided to go for Design 5 because the firey look of the design is really going to connect with the shirts. I’ve gone with the same colour scheme as my shirt, using Sky Blue for the main accent colour, and complimenting that with BA Yellow. I’ve chosen for the socks to go from Sky Blue to BA Yellow and finishing in White. We know that your team is going to have to decide on the nitty gritty parts of this kit, so we’ve made sharing super easy. You can easily share a web link so they can have a look (and even play with the 360 viewer to get a full and proper look at the design. In fact, if you want to have a look at my kit you can easily have a play by following my web link. You could print off your design to show people, or send them a direct link via email, this will help you get the design as perfect as possible before sending to us for a quote. When it comes to the actual sending off for a bespoke quote, just hit the “Get a Quote” button and we’ll get your email, get our design team to look over it and then one of our account managers will be in touch with the all important news. Our account managers will be with you every step of the way and will be able to answer any question, so please feel free to ask our staff any question you might have and we’ll be more than happy to answer it. 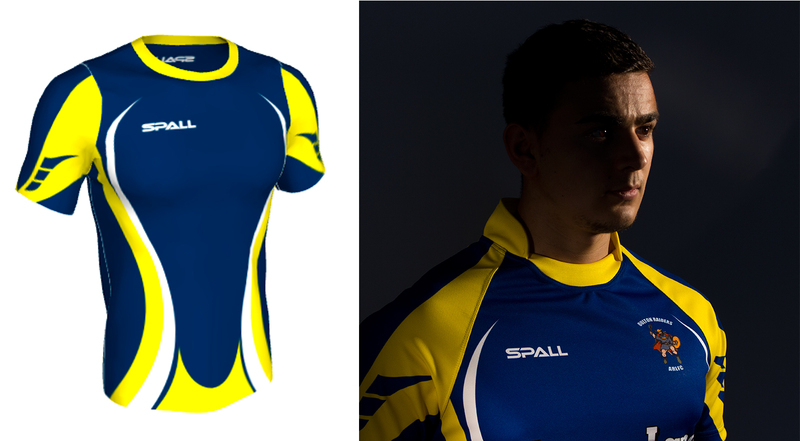 I represent Spall Sports Club (SSC) and we’ve designed a kit for our rugby team. SSC play with 15 on the field and 7 substitutes so we would need 22 kits, to begin with however we may need more later. Currently have two sponsors, we’d like one on the front of the kit and one on the rear. We would also like to have players surnames and numbers on the rear. We’ll also have our team crest on the left breast. We can produce any number of garments, whether you’re just getting the one shirt, or you’re buying 22 for your team and a further 25 to sell to fans. Just bear in mind, the more you order the cheaper they are per shirt. Whatever you design, we will make it come alive by using the best fabrics and inks available. Nothing makes these kits more unique than adding names and numbers and you can add unlimited logos, names and numbers to any kit for no extra cost. You can choose everything from the font, to the colour and style. The great thing about having an in-house design team means that everything can be perfected and made even more unique. You might notice that you can’t add names, numbers or logos to the kit builder itself. We’ve made the decision to make it like this because it gives us a great opportunity to give you a call and really perfect the design making it your ideal kit. So if you have a design all set up and you’ve submitted the form, then we can discuss the ins and outs of the actual personalisation then. However, before we have this call, it’s really important to know who your sponsors are, because we will have these kits made in just 2 weeks after artwork approval. But we can’t approve the artwork if it’s incomplete. It is also really important that you have the logos ready for us to use. If you can tick as many of these points it will make the whole process easier for both us and you. In some circumstances a high-quality PNG is acceptable, but for best results, we would highly recommend a vector. JPEG and other non-transparent formats sadly can’t be accepted. Do you have everyone’s name and/or number? (if you want to personalise this way. We don’t need this at the initial stage, but the sooner you get these details the sooner we can go to printing these designs). Of course, if you have any questions about this entire process. Or you get any questions when going through it yourself. Please get in touch with your account manager, they love to help; and they want to make sure you’re grinning ear-to-ear when you open the parcel, so please get in touch. If you’re interested in the process of how we make these sports kits in the UK, please have a read of our What Is Sublimation? post, hopefully, you’ll find it informative. If you follow these steps, you should get a great kit design to show off. Had something made by us? Get sharing on Instagram using the hashtag #spallsports – we love seeing our hard work in the wild.